CLEVELAND — Former President Barack Obama on Thursday decried "demagogues who promise simple fixes to complicated problems" — an implicit but clear rebuke to his successor, President Donald Trump, whom Obama suggested is regularly violating political norms and threatening basic democratic institutions. 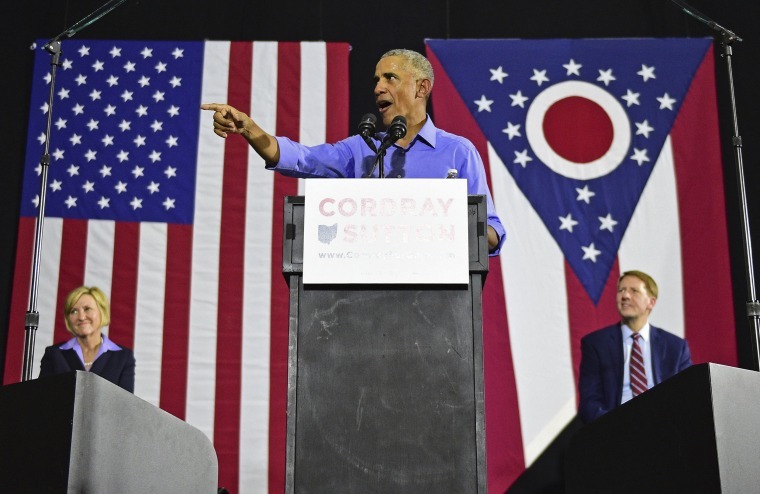 At a packed campaign rally on behalf of Richard Cordray, Ohio's Democratic candidate for governor, Obama implored supporters to vote in the midterm elections on November 6. "You've got to vote, that's why I'm here" he said, leading the crowd in a chant of "Vote, vote, vote." Obama never mentioned Trump directly by name, other than a passing reference to "the person in the White House." But the message was unmistakable. "None of this is normal," Obama said. Obama said that during his presidency he "was confident the American people wanted to hear the truth" — a pointed jab at Trump, whose penchant for hyperbole and fact-free assertions has been a persistent feature of his personality. Earlier on Thursday, Trump pushed back with no evidence on the notion that 3,000 people had died in Puerto Rico in the wake of Hurricane Maria last year, suggesting Democrats had padded the number to make him look bad. Obama's criticism of Republicans in Congress was more direct, saying that rather than provide a check and balance on Trump's behavior, "you see Republicans bending over backwards to be a shield." It was the third campaign foray for Obama in less than week. Last Friday, in a speech at the University of Illinois, Obama signaled he would be stepping back into the political sphere ahead of the midterm elections November 6. At that speech, Obama did call out Trump by name, and said there was some "crazy stuff" coming out of the White House. He traveled to Southern California the next day to campaign for Democratic House challengers in Orange County. Cordray was an early Obama supporter and was in turn appointed as the first director of the Consumer Financial Protection Board. He is running against Republican Mike DeWine, the Ohio attorney general and a former U.S., senator whom Obama criticized for his opposition to the Affordable Care Act, better known as Obamacare. Two term Republican Gov. John Kasich is retiring. DeWine on Thursday attended a campaign event with Donald Trump Jr., the president's oldest son. Obama won Ohio — for years the nation's most crucial swing state — in both 2008 and in his 2012 re-election race. But the state swung to Trump by 8 points in 2016 over Democrat Hillary Clinton.